Subway tokens, ISIS, education, regulation. The humble (and long) presidential candidate interview transcript continues to tantalize this cycle. No longer content to nibble at just one piece of oily, savory pepperoni, we want the whole slice, even that dry, cheese-less crust at the end. 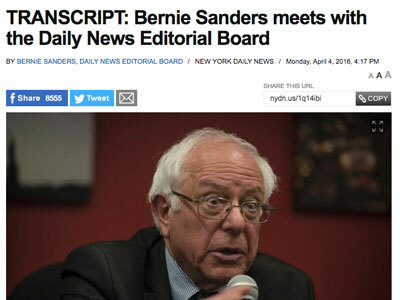 The New York Daily News obliges, posting the full transcript of its editorial board’s interview with Bernie Sanders. The largely critical postgame reports are already out, but if you want to tackle the transcript sans annotation first, you can get it here.